Your moderator at Italia is Cornellia Cornelius. Much has been written about Rome, both in fact and fancy. In Fabularum Bibliotheca, we investigate the classic literature written during the heyday of Roman history, penned by Romans and others. 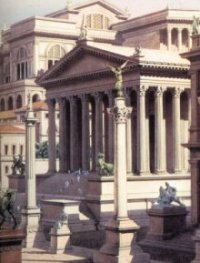 We take a look at contemporary writings, and consider the worlds of fantasy which have been published concerning Rome and her history. There's even a discussion on learning Latin. Welcome in! The fine aromas of age-old parchments await you.